The Chrysalis Club is a society of young leaders who are passionate about the mission of Visiting Nurse and the vital role hospice care plays in the health and well-being of our community. Members of The Chrysalis Club have had personal experiences with the organization’s compassionate care, have been active with special events and programs such as the BIG-TO-DO and Camp STARS, and/or are young community leaders passionate about helping Visiting Nurse thrive. The club takes its name from one of the stages in the life cycle of a butterfly. The chrysalis is the fruitful stage before something wonderful emerges. Club members believe the end-of-life journey can be just as wondrous. Members of The Chrysalis Club volunteer and support Visiting Nurse in various ways. If you are interested in joining The Chrysalis Club, please email the Office of Advancement or call 404-215-6010. 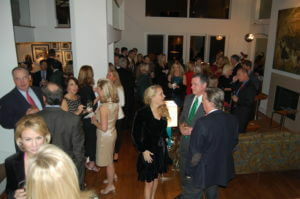 The Chrysalis Club hosts events throughout the year. One such event is Party with a Purpose, which benefits our hospices services. Opportunities to support Visiting Nurse Health System through the Chrysalis Club include volunteering (with hospice services, Camp STARS, and other areas), planning and coordinating events, and creating welcome baskets for our patients and their families.